I am working on yet another Split 9-Patch. 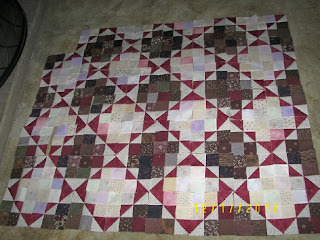 That red in the HSTs was the only fabric I purchased for this project. 55 blocks done so far - the goal is 80. It was looking somewhat blah, until I added those light "sparkles" of lavender, pink and a few yellows. I realized too late the dark area could have been arranged in a better pattern. That's OK.
No pattern - blocks are 6 inches, finished. It's looking good to me. My crazy knitted blingy scarves have found homes for Christmas, and several Christmas Banners have also found homes. I still have a few surprises hidden from DH, who has a birthday on the dreaded 12/21, end-of-Mayan-Calendar-date. Perhaps I should give them 12/20??? He asks only for my Lasagna each Birthday - it always turns out delicious. This just begs the question..."You HID lasagna?" How sweet is that? He loves your lasagna! I seem to be attracted to brown lately so this quilt is calling to me. Very pretty quilt and yes it does sparkle! Enjoy the lasagna. My hubby always asks for homemade cherry pie for his birthday. Hi Elaine, I'm adding your blog to my list in part because you are living in the Panhandle (love your header photo), but also because I like your quilts! I grew up in Scottsbluff and visit every year and miss it when I'm not there. Always go to Prairie Pines Quilt Shop when I'm home. Nice looking split 9-patch! I love your no pattern doin' it my way type of patchworking. Merry Christmas to you and DH! Merry belated Christmas Elaine! The scarfs look very stylish. Checked out those vintage Santa's--I like them! A lasagna man--hmm--I know one just like him. Dark areas could be better arranged? Hmmm--I don't see that one. Are you getting snow?? Hi Elaine, your quilt is a winner. 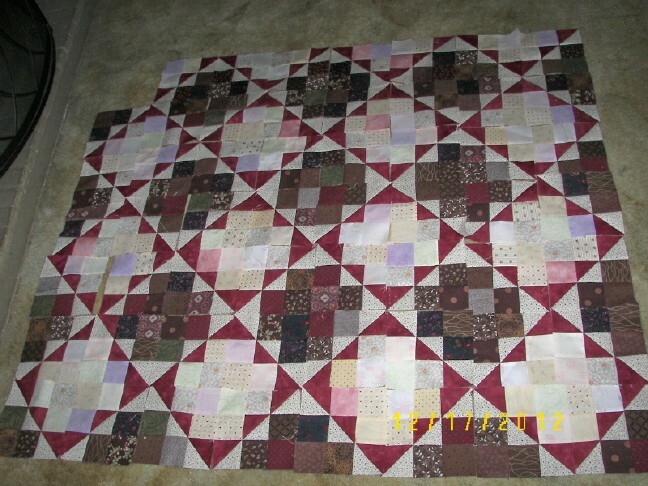 I know you will think of a cute pieced border to add! Hope your holidays were great and your new year even better!